The focal point of our downtown campus, The New School's University Center features bright and open study spaces, a library/research center, a new auditorium, state-of-the-art classrooms, a cafeteria, and more. The Innovation Center, open to New School students and faculty 24 hours a day, facilitates creative and interdisciplinary learning. 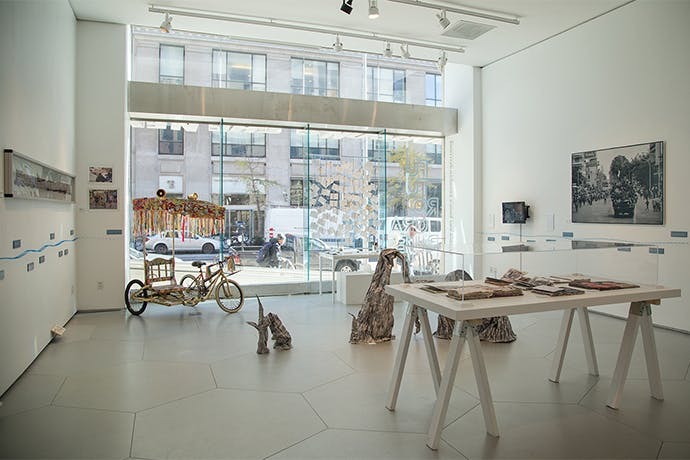 Part of the Sheila C. Johnson Design Center, the Anna-Maria and Stephen Kellen Gallery exhibits student, alumni, and faculty work, placing special emphasis on global social awareness and collaboration. Located at 55 West 13th Street, The New School's 20,000-square-foot facility offers spaces in which students can develop their artistry. Here students improvise in one of many rehearsal and performance spaces. Students gather around the Haas CNC machine in the new Making Center, a network of creative facilities and collaborative spaces that offer students access to cutting-edge technologies and opportunities to develop industry-ready skills. Access to the most modern and traditional tools, labs, libraries, and more fosters our students’ creative and intellectual growth. These facilities are designed to offer hands-on experience that is relevant and inspiring to our student body of progressive thought leaders and engaged citizens. 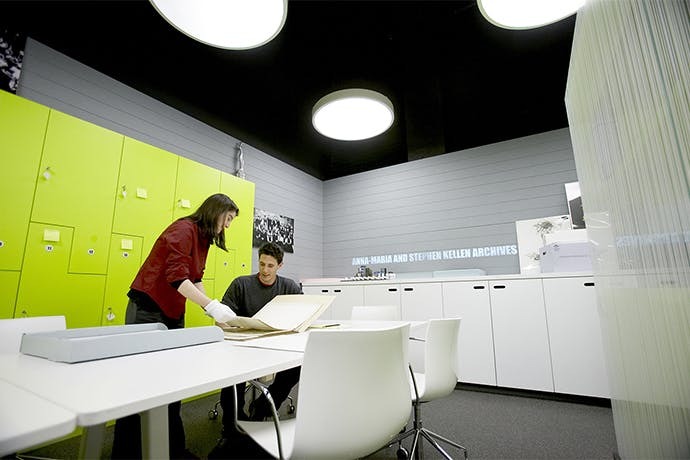 The New School Libraries & Archives provides access to collections, services, and spaces sufficient in quality, depth, diversity, format, and currency to support the research and teaching missions of The New School. Together, these collections, services, and spaces support The New School's interdisciplinary approach to education and offer an excellent starting place for research. Visit us onsite at the List Center Library, University Center Library, and Performing Arts Library, as well as at the Archives & Special Collections in the Sheila C. Johnson Design Center. The university has invested more than $30 million in a series of extensive labs and information technology services. The largest lab, at Arnhold Hall, spreads over four floors with six hundred networked workstations and include all relevant platforms. The labs are set up with a variety of printing options, and students receive printing accounts at the start of each semester. While on campus, students can take advantage of the university wireless Internet network. Digital projectors, surround sound, and active white boards feed into equipment racks that enable presentation of all media types in the classroom. Portable production equipment reservations, including digital still, video, and audio equipment, are readily available. Extensive, adaptable workspaces are available at our new 28,000 square foot Making Center hub, which opened in fall 2016 for student use, and at satellite making spaces across the university. Professional technicians and facility managers are on hand to support individual student needs and to lead training sessions and workshops. The New School houses two galleries in the Sheila C. Johnson Design Center, an award-winning design by Lyn Rice Architects, measuring more than 4,000 square feet and including plasma screens, a rotating wallpaper design, and an innovative student critique area. Filled year-round with exhibitions of work by outside artists and designers, faculty, and students, our galleries are an important downtown destination for art and design programming. Students and faculty also present their work in other on-campus and satellite venues throughout the city. 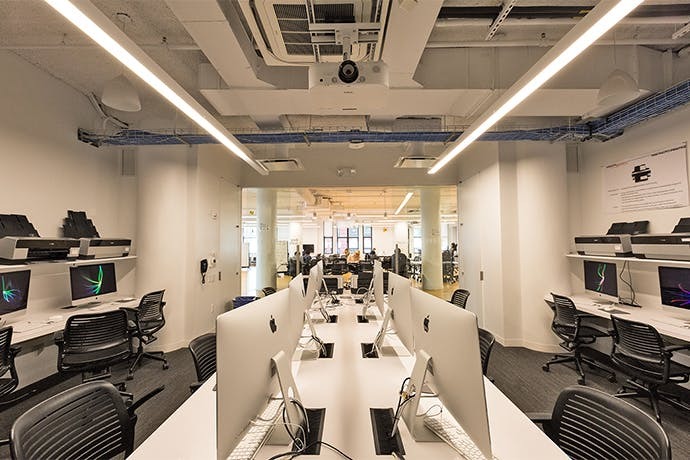 The Innovation Center, located on the 6th floor of the Albert and Vera List Academic Center, is one of the most technologically progressive collaboration spaces on campus. It offers resources such as the Learning Space Lab, printers, conference rooms, huddle spaces with air media display, laptop checkout, and community lockers. 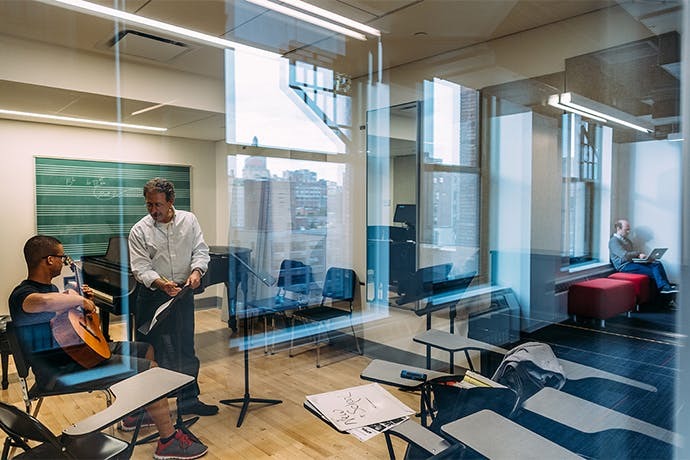 The New School has designed practice, rehearsal, and performances spaces to help young artists realize their goal of becoming successful music and drama professionals. At 55 West 13th Street, the school's 20,000-square-foot facility houses the Performance Space (seating 120). Additional university performance facilities within a two-block radius of the Greenwich Village campus include a 170-seat performance auditorium and an excellent acoustically balanced concert hall with an audience capacity of 500. The School of Drama's undergraduate program is located on the 9th floor of 55 West 13th Street, containing six BFA studios. Graduate programs are located at 151 Bank Street in the West Village. 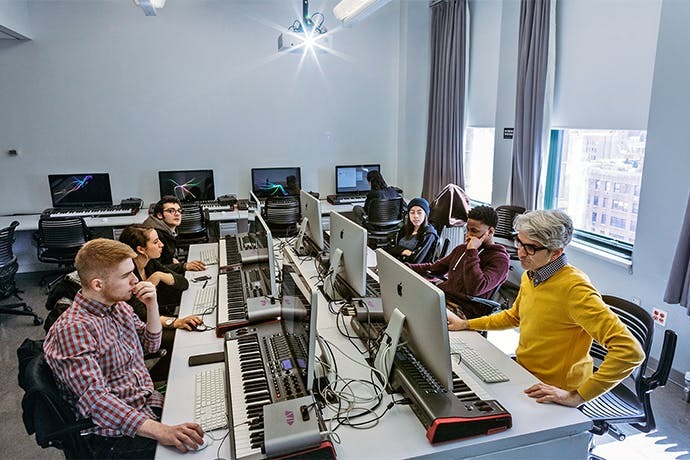 The Bank Street facility includes several MFA studios on the 2nd floor, and a Black Box performance space with state-of-the-art sound and lighting systems on the 3rd floor. The Black Box seats 199, the size of a standard Off-Broadway house. Recording studios are available for recording and engineering. Both studios are connected to the university's server and Internet sites, allowing for posted archival recordings and live streaming performance. The University Learning Center (ULC) has a variety of resources available to both students and faculty. For students, these include handouts on academic writing and skill building and, for faculty, these include handouts to aid with instruction as well as helpful information on how your students can make the best use of the ULC. Students can also request specialized one-on-one or group tutoring sessions on topics such as Adobe Creative Suite, computer programming, ESL, general writing, graduate writing, math, and time management. Services offered by ULC are available on a walk-in basis and by appointment, which is easy to schedule online. 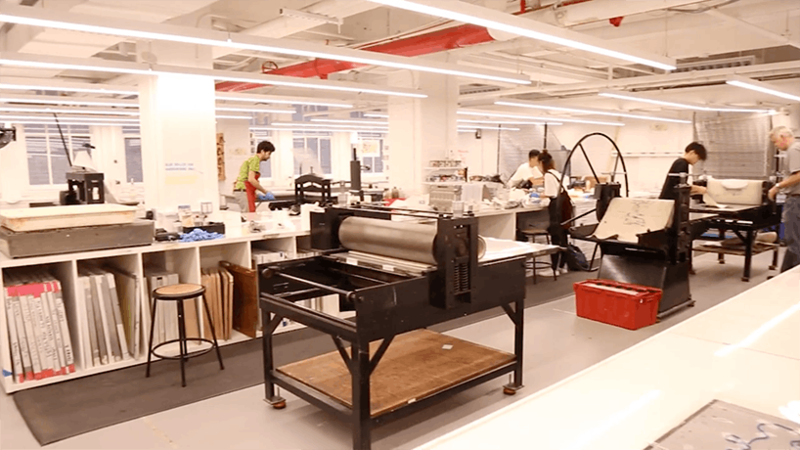 Our Parsons Paris campus also offers state-of-the-art facilities, including fashion studios, a computer lab, a making lab, and a library. The fashion construction studios include menswear and womenswear dress forms, 16 industrial sewing machines, 3 overlockers, a coverstitch machine, 4 industrial iron stations, a leather arm and machine, a buttonhole and zig-zag machine, and 14 large pattern and drafting tables. 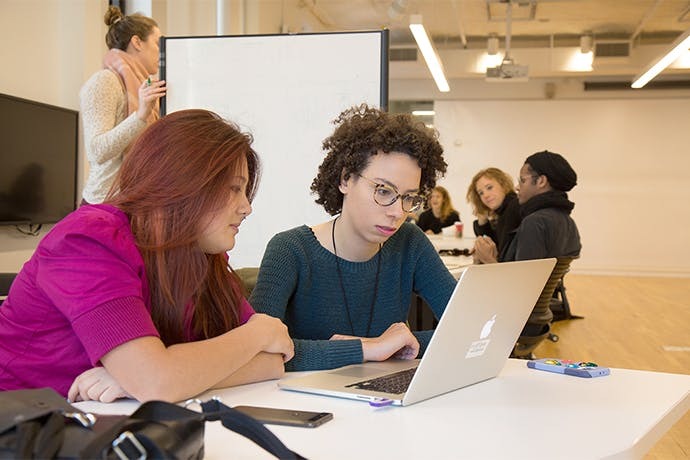 Parsons Paris faculty and students have access to all resources available through The New School's library and its partners. For additional details and a video introduction, visit the Parsons Paris Library Resources page. Additional resources are available throughout Paris, including those listed below.